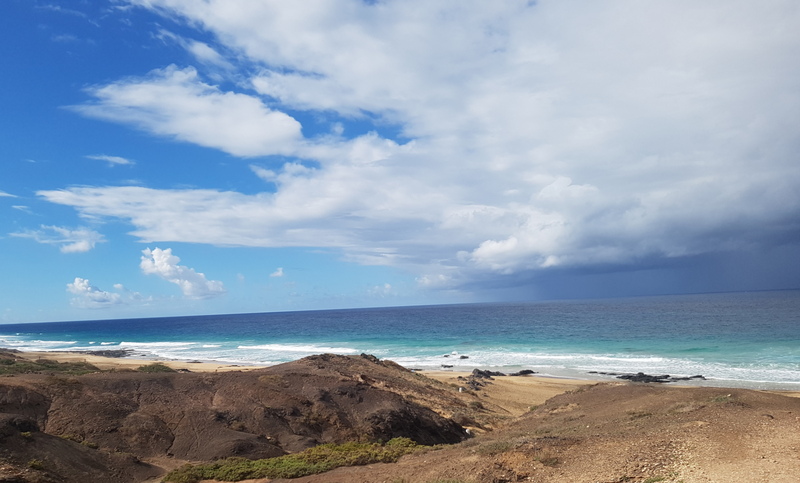 This November Martin and I went on a retreat together for the first time and we couldn’t have chosen a better spot to do so than the yoga and Pilates Surya Retreat in Villaverde on the island of Fuerteventura, Spain. It was my third time attending an Azulfit retreat within two years and that is for good reasons. We wanted to take a break before the hectic holiday season, spend time together as a couple, read, be mindful of our connection, and give our body, mind and spirit some much needed TLC. Surya offers the perfect mix of classes and personal free time and it will have you find your Zen in no time. In between classes you can venture out and discover the island and its amazing beaches on your own or just chill at the pool, read a book in the lounge, or take a stroll around the villa. 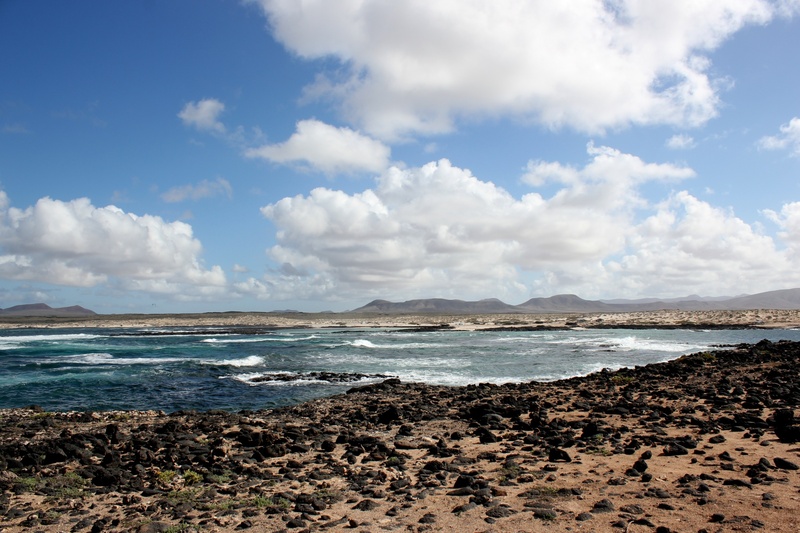 Fuerteventura is part of the Canary Islands, located east of Morocco and is of volcanic nature. As a result, it looks like a desert island, with little vegetation, is mostly hilly, and with large parts that are uninhabited. 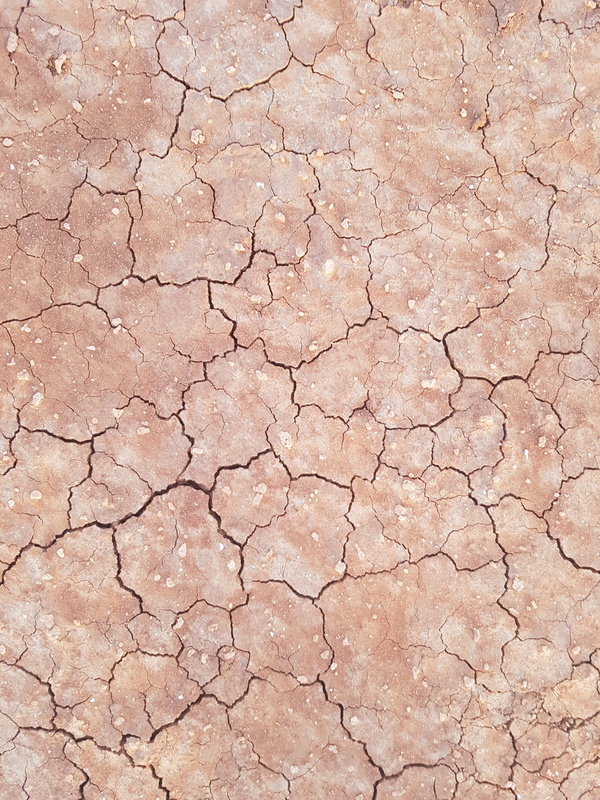 It feels like you landed on Mars at times and it is very rugged at first sight, ranging from dusty red landscapes to wonderful pristine white sandy beaches. 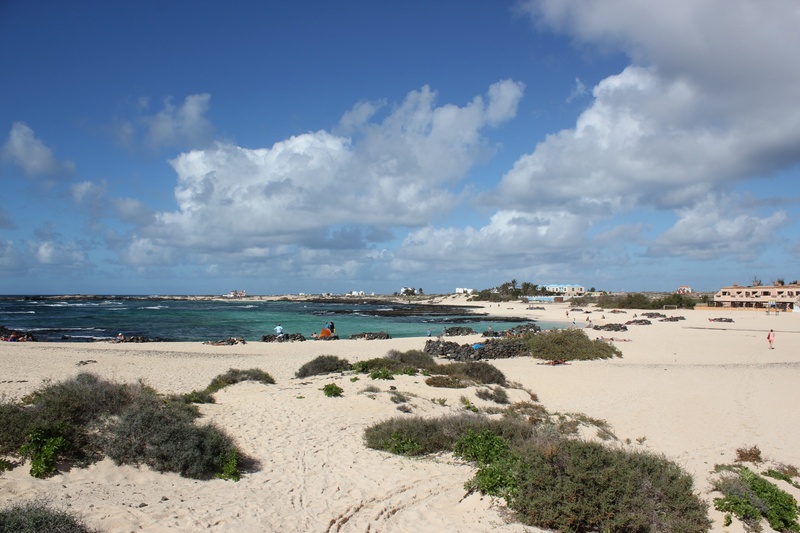 Corralejo is the main Northern city of the island, closest to the retreat and offers a wide variety of shops and hotels. It’s rather touristy so I don’t recommend spending too much time there. November is low season though so you will not feel crowded wherever you go. 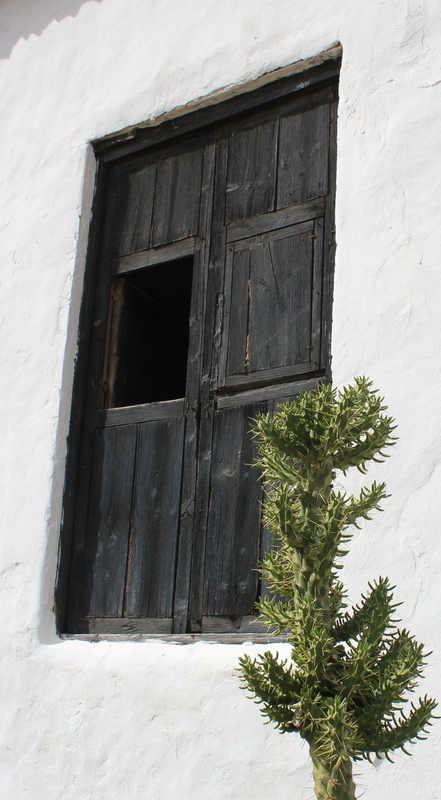 It’s usually windy on Fuerteventura and moderately warm even in the winter months. I have been once in August, and twice in late November. 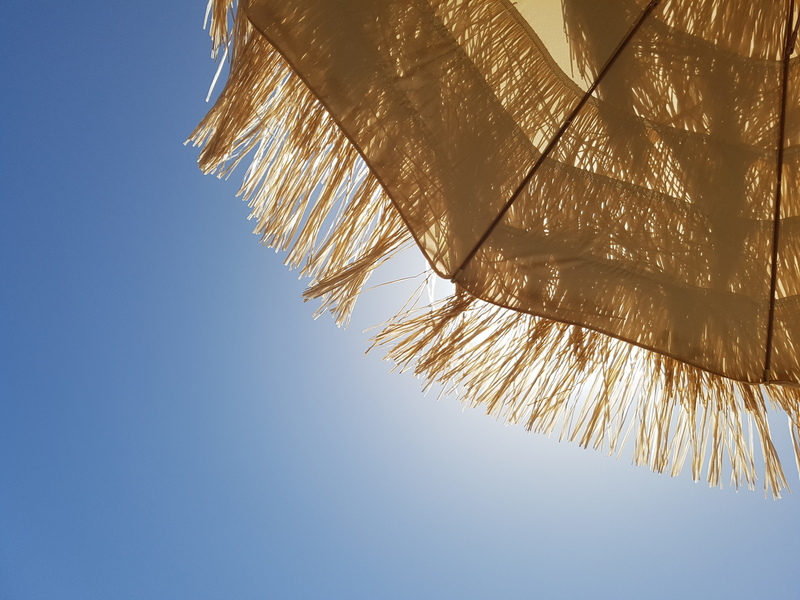 The summer months are hot and busy so I recommend going in November because you get to indulge in sunny and warm days when the weather in mainland Europe is already cold and rainy. This time we were very lucky with temperatures around 25 degrees Celsius and sunny days during our entire stay. But you can also get a week of overcast weather during that time so there is a bit of luck involved. 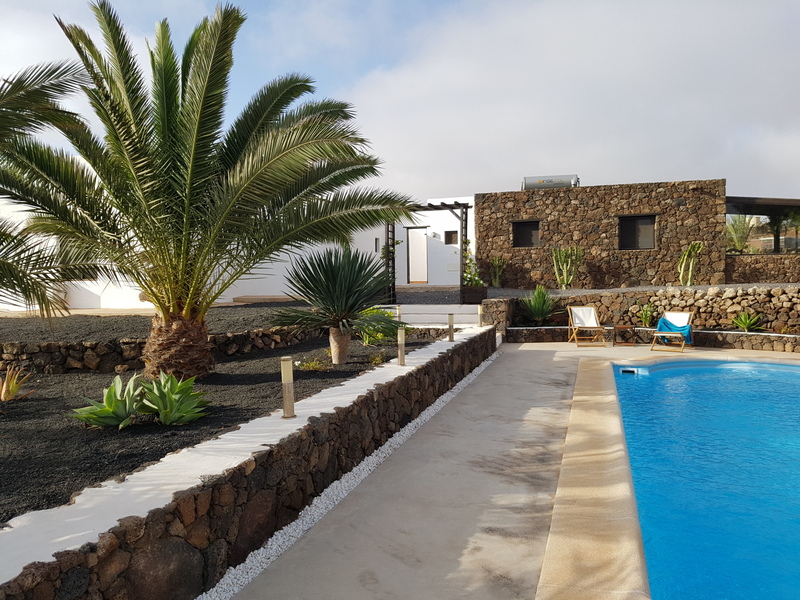 Surya is a beautiful villa built in the original Canary Island style: White houses with stones intersecting the walls, as well as colorful doors and windows. All the rooms are nicely decorated, some with en-suite bathrooms, some are bungalows. We stayed in the Rejuvenate room and had our own private bathroom, which I recommend if you go as a couple. 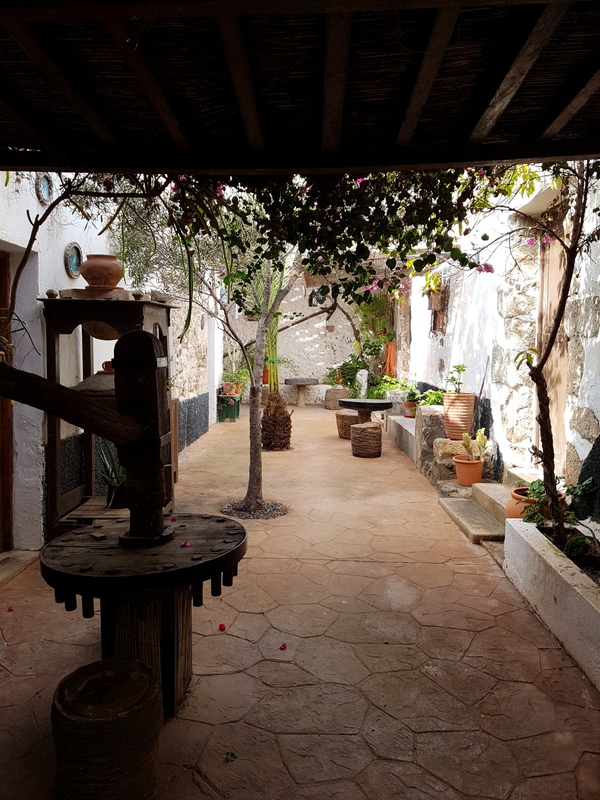 There is a lovely pool to hang out at, an inviting lounge for reading and chatting with the other participants, or you can discover the area around the villa by taking a stroll to the nearby windmills on top of the hill. The retreat offers daily morning and evening yoga and Pilates classes. They usually start between 8am and 8:30am and between 5pm and 5:30pm respectively. The classes fit all levels, from beginners to advanced practitioners and are very well taught. Some are double lessons (2 hours), some are meditation classes. The schedule changes depending on the staff who is on site. You can choose to attend as many or as few as you like, giving you lots of freedom in how you want to spend your vacation and allowing for some rest days if you need them. You can ask the team to send you the schedule and who is teaching the classes ahead of booking. Valentina teaches the yoga classes and I am very impressed with how she consistently delivers her teachings with a lot of compassion, the necessary push and an in-depth understanding of the practice. She has many years of teaching and continuous teacher training on her resume and is able to really pay attention to the different needs and levels of the people in the class. She is a delightful person and very approachable and your practice will greatly improve no matter how experienced you are. This time around Jamie taught the Pilates classes. He is the owner of Azulfit and usually resides in California but has moved to Fuerteventura for the next few months. He is a true Pilates guru and will push you while still taking the time to adapt the exercises to the beginners in the class. He incorporates props and there are also two reformers on site. When Jamie isn’t around, Jo teaches Pilates in his place. She is very knowledgeable about the principles and will give you a sound understanding of the importance of getting the basics right. A few of the classes will be meditation classes, usually led by Frauke. I myself like to meditate on my own so I don’t attend those but I know that people enjoy them. Martin did as well. They are usually guided meditations around gratitude or other aspects of mindfulness. As part of the package you will receive a complementary one-hour massage. There are two therapists working for the retreat and they are equally great. My massages were always very relaxing. You can also book additional massages and treatments for your time there. Jo Dombernowsky is the brain behind the food at Azul (as mentioned she also serves as an excellent Pilates teacher when Jamie isn’t there). She is a holistic nutritionist and incorporates a lot of Ayurveda aspects into her recipes and the cooking done at Surya. There is a team of cooks responsible for the daily cooking and they are all great at what they do. I cannot stress enough how amazing the food is: everything is fresh and home-made, absolutely no convenience food or ingredients ever and loads of vegetables and fresh fruit! You will never feel hungry because everything is so good that you usually go back for seconds. 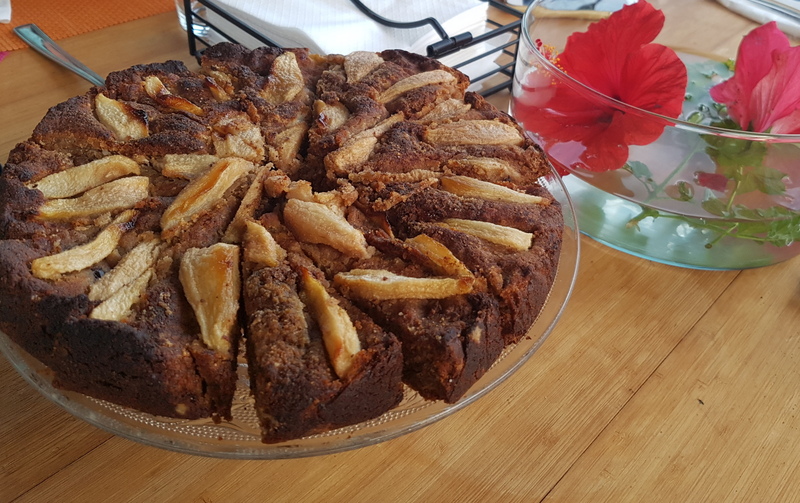 Breakfast boasts a wide array of fresh fruit: papayas, kiwis, cantaloupes, bananas and more, home-made yoghurt, granola, muesli (gluten-free and regular), ghee, home-made jams, cinnamon porridge, whole-wheat pancakes and many more incredibly yummy dishes. Dinner usually offers salads, cooked vegetables, veggie burgers, tofu chili con carne, dhal, vegetarian curries, and other dishes that make you wonder why we aren’t just all vegetarians yet. 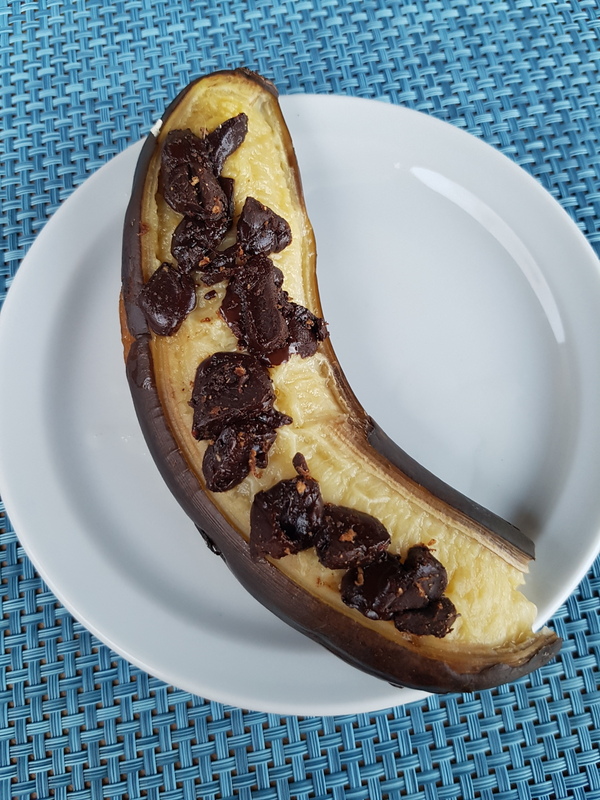 And of course the famous desserts including oven-baked banana with dark chocolate, date cocoa truffles or amazing carrot cake for example. Martin is quite the picky eater, he is super health conscious and hates to eat mediocre food (or junk food). At Surya he was absolutely in heaven! You will never eat the same thing twice and you definitely won’t miss eating meat believe me. Jo has published an e-book with some of the favorite dishes so you recreate all the goodness. In short, Surya hands down offers the best vegetarian food I have eaten anywhere. It is one of the main reasons I keep coming back to Azul: it is diverse, nourishing, and just so healthy that you literally wish you had your own Surya chef at home to keep cooking for you once the retreat is over. Everyone who has been there agrees! Eating is done communally at Surya, meaning everyone eats together at the same time, seated at three large tables. There will never be more than 20 people at any given time doing the retreat so it feels like you get to know the people quite well. You can choose to eat and then retreat to your room or stay on and have tea and talk to some of the interesting people likely attending the retreat. It is always a very diverse group in terms of nationality, age, gender and levels of practice which makes for a lovely experience all around. The participants come from all over Europe. There are more and more men and couples doing the retreat so don’t feel shy if you’re a guy and are worried about fitting in. Martin and I were one of three couples there during our week. There will be no dinner at the villa on two nights, so you can either choose to eat at the restaurant organized by the retreat or go out on your own. 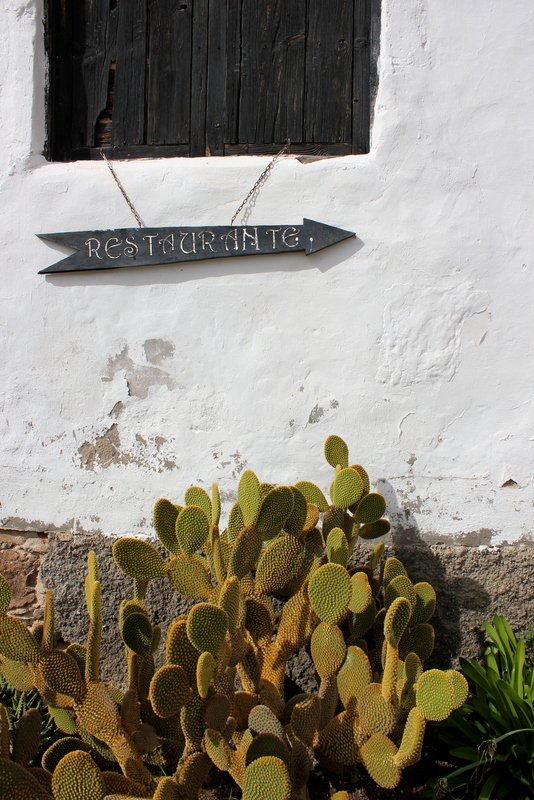 The two restaurants that you can go to with the retreat are Casa Marcos in Villaverde and Vaca Azul in Corralejo. Casa Marcos offers good Tapas, Vaca Azul mostly seafood. I don’t care much for either restaurant and we wanted some time to ourselves so we chose to go to Corralejo and found some nice places to eat. 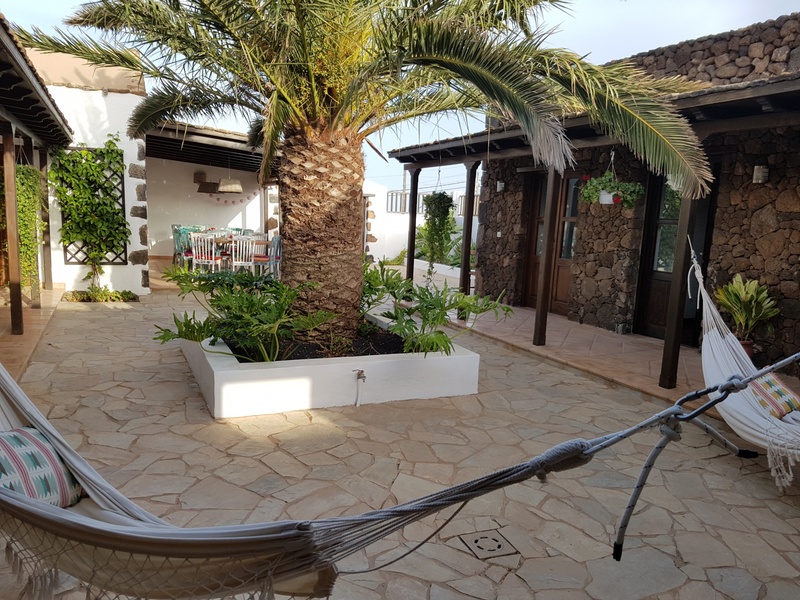 I was really keen on not messing up the wonderful diet we were eating at Surya and so we chose vegetarian: one night we ate vegan burgers at D.Sanchez Bar and another night we had a fairly decent pizza at Peperone, both in downtown Corralejo. The burgers come with tons of sides and you can choose your own patty. The pizza at Peperone’s was thin crusted, fresh and tasty. Both places were quite cheap at around 25 euros for both our dishes and drinks. Jo usually does an introductory Ayurveda/Nutrition workshop once a week. It’s a great way to get to know some of the basic aspects of healthy eating from a traditional Ayurvedic point of view. It will introduce you to your Ayurveda type and serves as a great starting point for elementary Ayurveda knowledge. 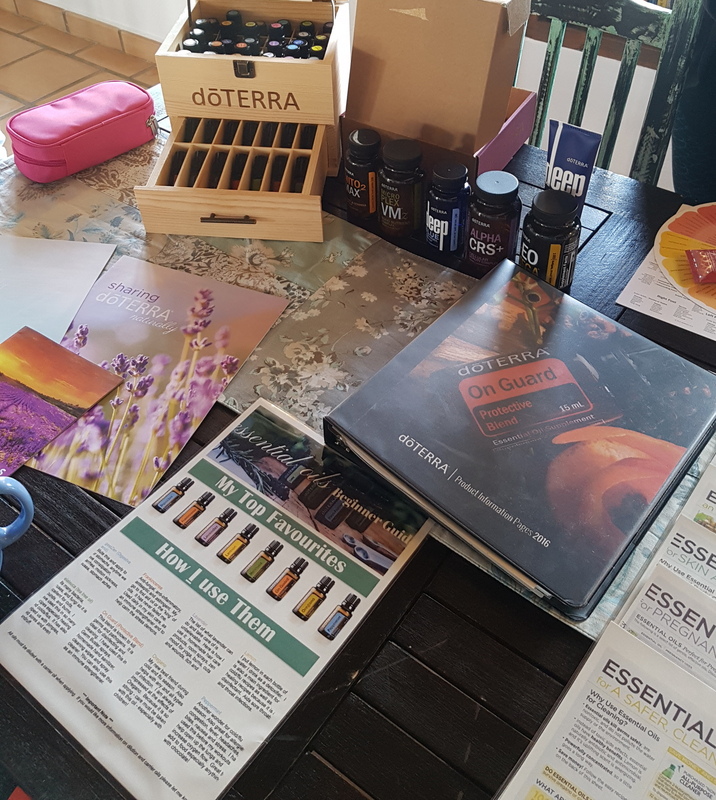 While we were there last time, I attended an essential oil workshop led by Sarah. I already used lavender and peppermint oil for some things but this course gave a great overview of some of the most popular oils and their therapeutic uses. I loved hearing all the great alternatives essential oils offer to some chemical ingredients I used. I have now bought a new diffuser and am using oils much more often and want to take a more in-depth class soon. More about this workshop and the class will follow in a future blog post. 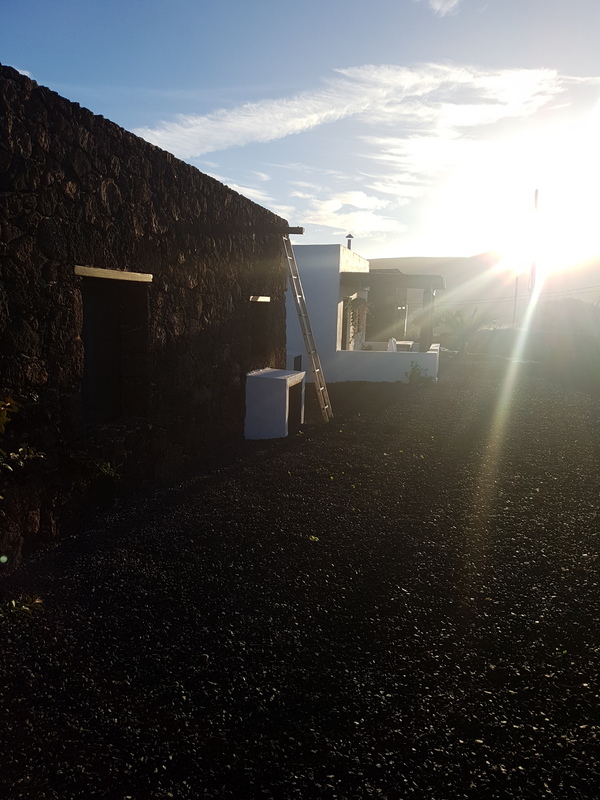 Villaverde is perfectly located a 10 minute walk from a volcano. 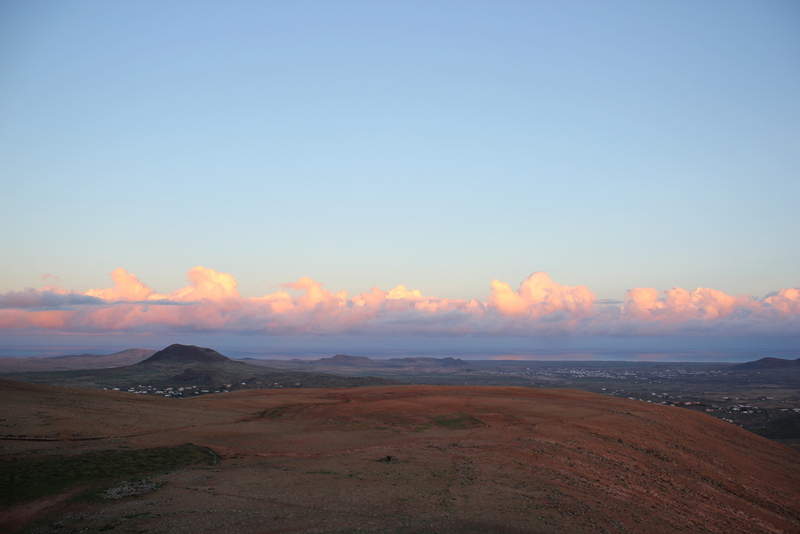 We chose to do a sunrise hike on a day where there was no scheduled morning class. It was amazing! It’s not very strenuous (most people can do it without too much effort) but you should wear good footwear as it is gravel and you can easily trip. The hike to and from the volcano takes about 3 hours. We were blessed with perfect weather, witnessing a sunrise that makes you instantly feel grateful. Martin loves to surf so this was one reason why we settled on Fuerteventura for our vacation together. 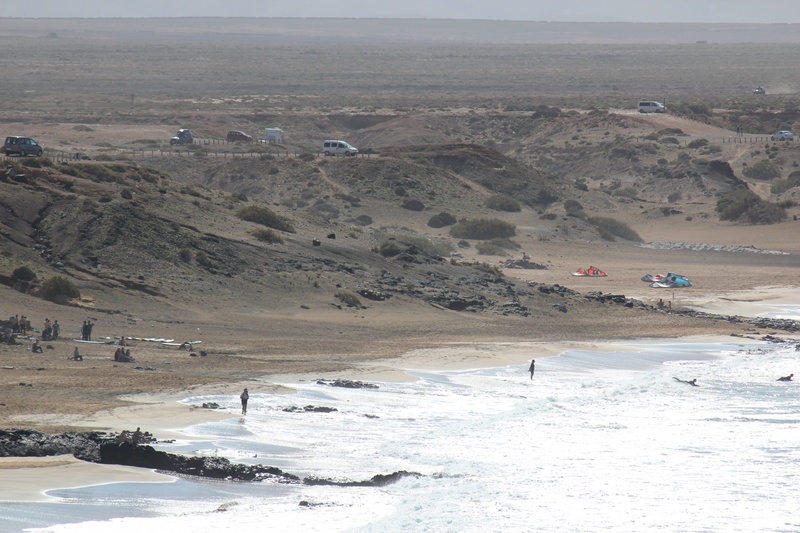 Fuerte is very famous for its surf spots, with tens of them lined along the north and south shore of the island and perfect conditions year round. You can rent surf boards and material everywhere near Corralejo and El Cotillo for 35 Euros for 3 days, in other words it’s cheap. 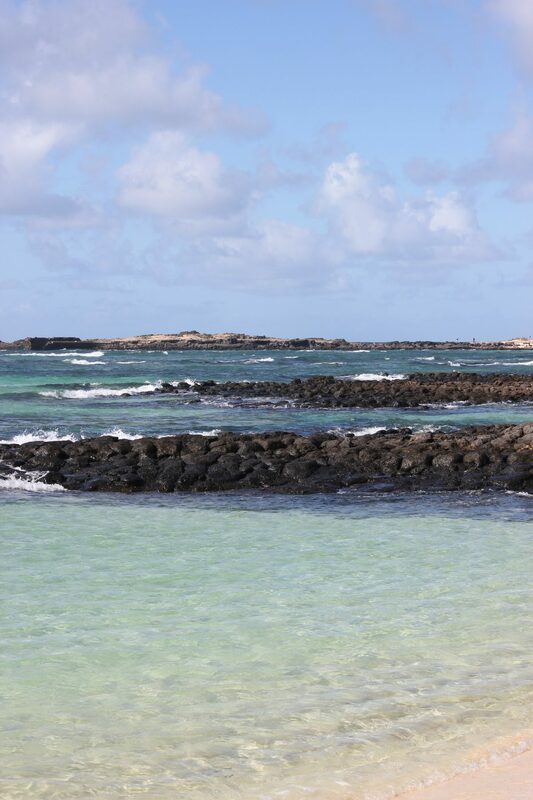 Our favorite beaches are around El Cotillo. They boast some of the most secluded lagoons and crystal clear water. If you don’t mind some nudists strutting their stuff you will love these beaches and the peace and quiet they offer. We decided to rent a car since Martin wanted to be flexible in choosing which beach to go to for surfing. 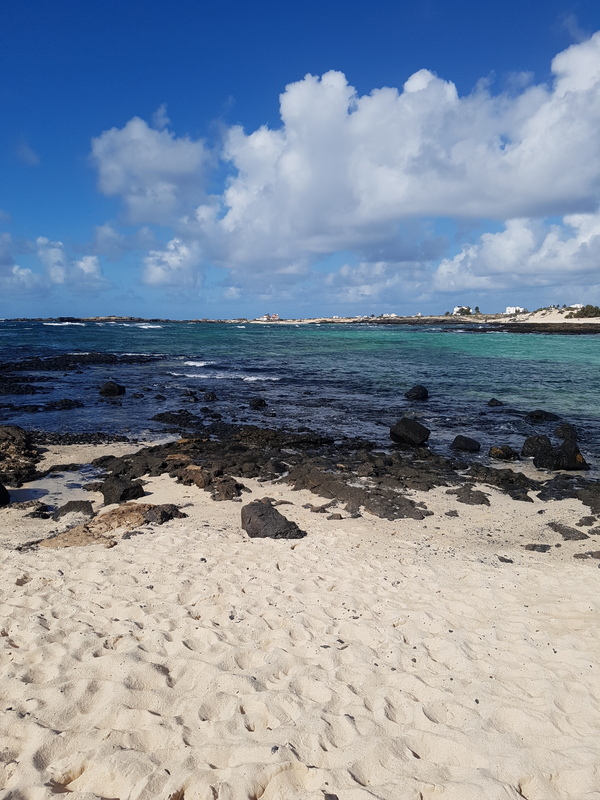 I also liked the flexibility it gave us since Villaverde is only connected to Corralejo and other towns by bus or taxi. Car rentals are fairly cheap and unless you are fine with just staying at the retreat villa you might like the freedom a rental car offers. Look for an energy efficient model whenever possible. 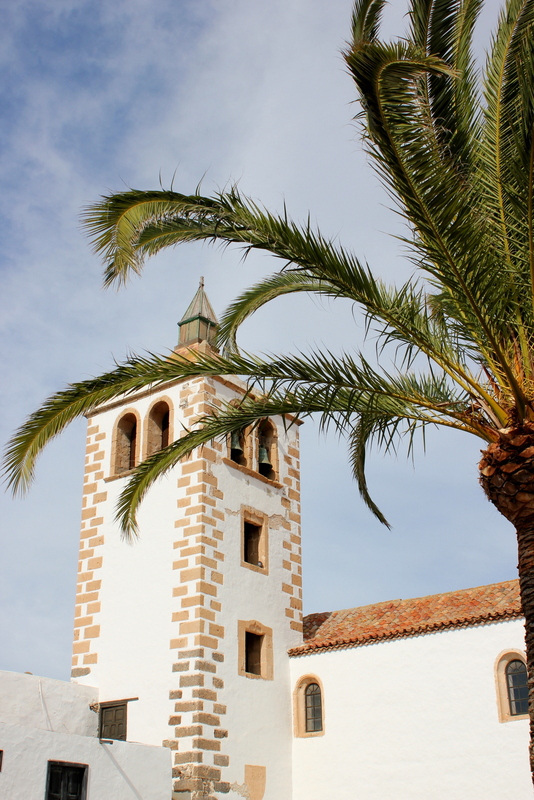 We loved the historic town of Betancuria, where you can sit in the old town square and listen to Spanish guitar players or visit the historic church and its treasures. 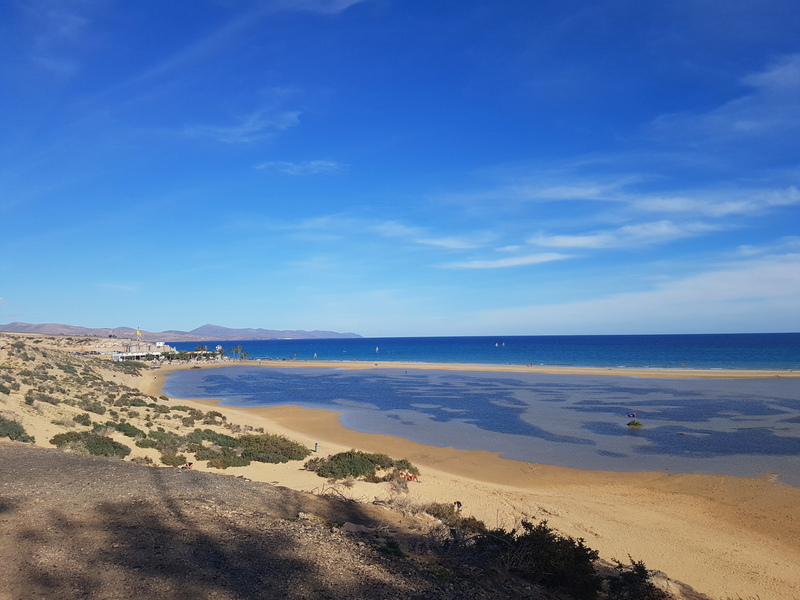 Further south you will find the wide and white sandy beaches of Costa Calma where perfect wind surfing and kite surfing conditions attract many water sports fans. 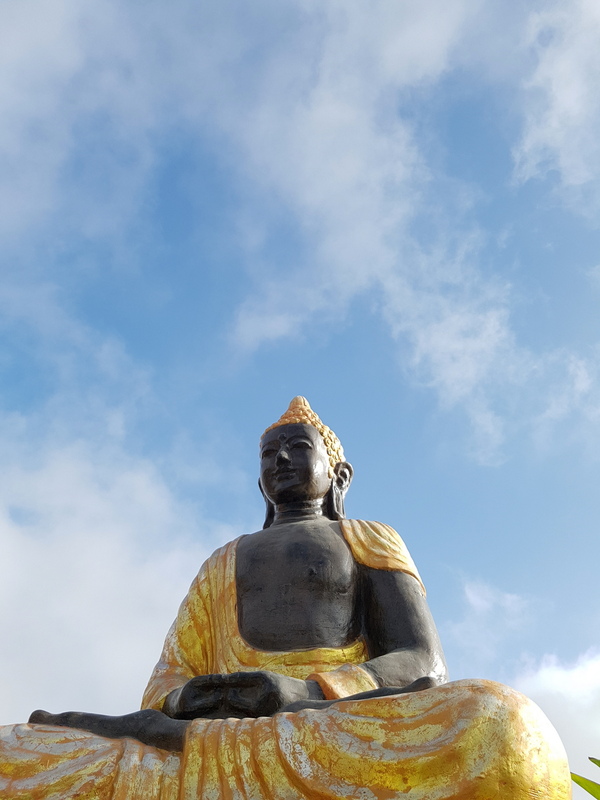 It’s difficult to find a more mindful and relaxing place and in terms of the quality of the classes and the food Surya it is right up there with other famous retreats. Everything and everyone at Surya will make you feel at ease, meaning you will have no stress unless you create it yourself! It’s just a lovely place, whether it’s your first yoga and Pilates retreat or you’re a seasoned yogi. You will meet lovely people and get a chance to spend your time with them or fly solo if you prefer. 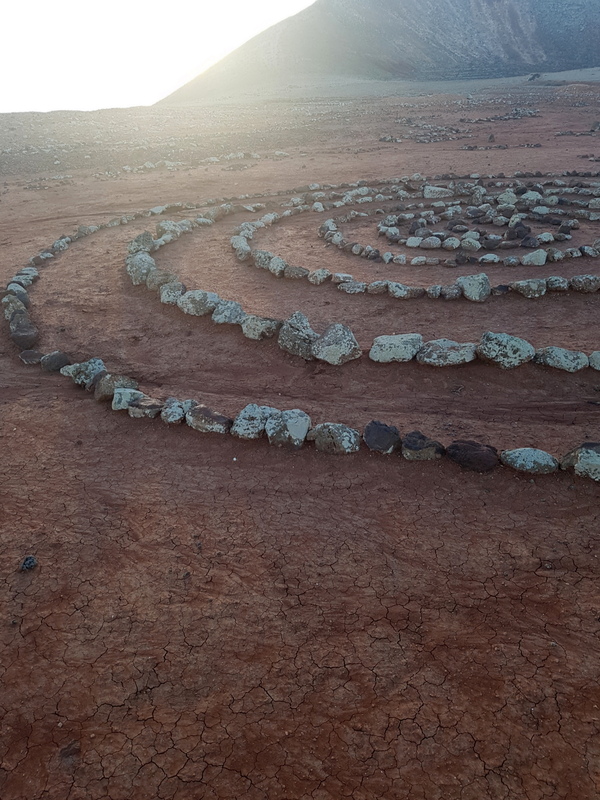 It was a great place for Martin and I to do some relationship work, reading books together and reaping the benefits of meditation and be conscious of our interactions with each other in a very tangible and immediate way. Although not explicitly focused on eco tourism or certified in any way, Surya retreat tries to be as green as possible by reducing water consumption, only changing towels once a week and not changing the linens during your stay (one week). The food is vegetarian/vegan and that reduces a lot of the impact usually encountered when staying in a hotel. Points have been taken off for the fact that to discover the island, you will most likely need a car. In addition, I would like for all the cleaning supplies and cosmetics offered on site to be eco certified (which to my knowledge they are not yet). 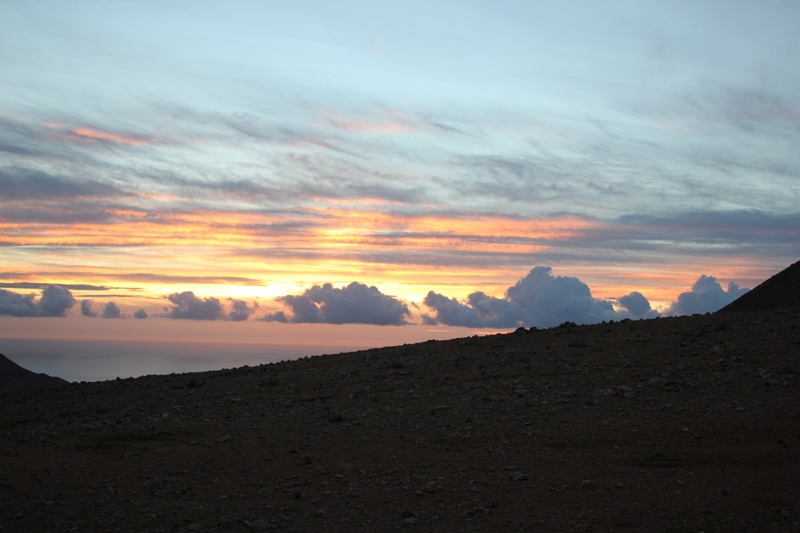 Since you will mostly be flying to Fuerteventura, don’t forget to offset your CO2 impact by donating to atmosfair.com. If you are familiar with the costs of a yoga and Pilates retreat you know it can be quite pricey depending on where you go. For a one week retreat, with classes twice a day, and the amazing food you get at Surya this is very good price value. This is why there are so many return customers, you get a 5% rebate when returning. We spent around 1100 Euros per person per week for the retreat, the rental car for 8 days, and the spending on our trips around the island. 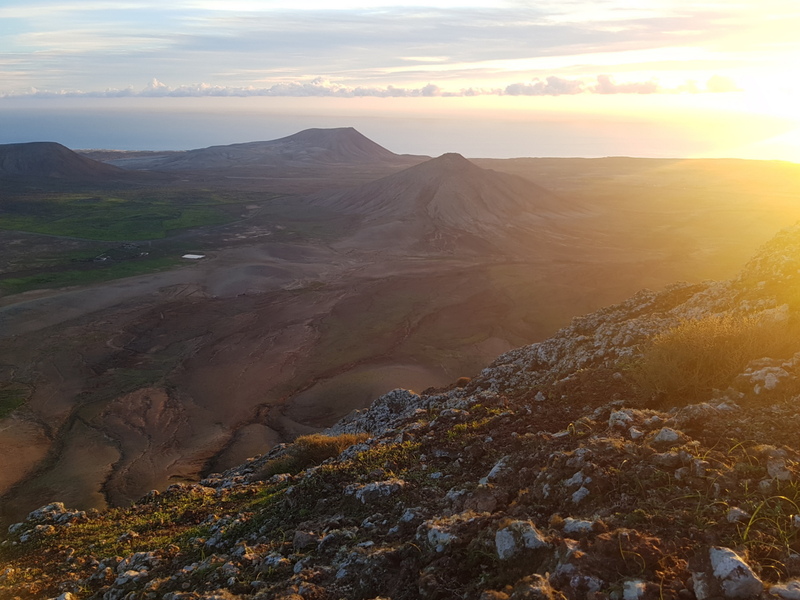 Flights from Europe to Fuerteventura run anywhere from 200 euros to 350 euros depending on the season. Easyjet is the cheapest option flying from Switzerland.